This is the second book I’ve read by McCullough. 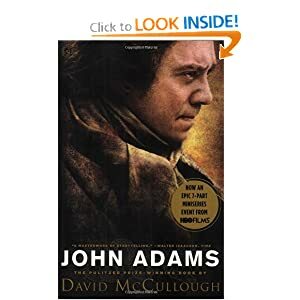 I enjoyed his work in 1776, and I enjoyed John Adams even more. This book is a fascinating and enjoyable read about the second President of the United States. Adams played a pivotal role in the first two sessions of the Continental Congress, debated fiercely for a declaration of independence, and was instrumental in most of the major decisions made before and after the Declaration, including naming George Washington as the commanding officer for the war. He wrote extensively, as did his family, and luckily, most of the communication survives. McCullough masterfully mixes in words that Abigail (his wife) and John wrote to each other and to their family to flesh out the literary portrait of his life. He travelled more extensively than any of his peers, making two trips across the Atlantic. He worked with Benjamin Franklin and Thomas Jefferson in France to establish a peace treaty with the British that ended the Revolutionary War. He was the first American diplomat in the Netherlands, where he secured a much needed loan from the Dutch. He was the first American diplomat to England after the war ended. He was responsible for the creation of the American Navy, correctly surmising that naval strength was the path to security at home and respect abroad. The one item that I found most fascinating about the entire Adams’ saga was revealed not long after Washington became President. It would seem to me that after the amazing accomplishment of winning Independence from England, that everyone would be on the same side and pulling the same rope to secure success for the fledgling country. Surely the dissonance and infighting of our current system did not exist at the founding of the country! And yet it did, and in some ways was even more ridiculous. Two parties emerged, the Federalists and anti-Federalists, and a newspaper sprouted up for each group spouting off ridiculous, inflammatory, derogatory half-truths and fallacies. It was pretty amazing to see the lengths the groups would go to in order to discredit the other group and revere themselves. Even the patron saint of Unites States Liberty, George Washington, was not immune to their attacks. And great personas such as Thomas Jefferson and Alexander Hamilton were behind the scenes exhorting their peers and the papers to greater heights of infamy. Reading the book, I have become more convinced that reaching common sense decisions on large topics is not possible. There will always be vocal dissenters willing to spread misinformation for their own goals and gains. I highly recommend you read this book. It is a great history of our country and will give you a new perspective on the political tomfoolery that is taking place today. Rating: 4.5 out of 5 – it is not a 5 only because a book like this isn’t easy to pick up and read over and over again. I was amazed at the influence and patience wielded by John Adam’s wife, Abigail. She wrote thousands of letters to her “best and dearest friend” while he was away from home (and sometimes country) on political business. She supported his work for independence, helped him refine his ideas, and encouraged his perseverance when political foes assailed him, all the while running the farm and homestead at a profit, and raising their children in his absence. McCullough does an excellent job of making their love and relationship come alive over the many pages of this book. I felt John’s grief when Abigail died. Not just a great account of a founding father, but a founding mother, also.